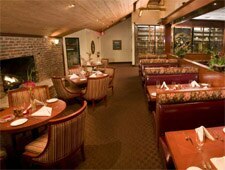 Wine and California-French food in a relaxing atmosphere near South Coast Plaza. : Yes, South Coast Winery Restaurant & Tasting Room in Santa Ana is owned by the South Coast Winery Resort & Spa in nearby Temecula. Fine woods paired with a familiar red and white color scheme give a winery feel to the venue’s slightly sparse interior, and they do a pretty good job of minimizing the urban clutter that can be spotted from the cozy covered indoor-outdoor patio. The ambience created is consistent enough to make this place a solid option for those seeking a lunchtime respite from the workaday world. The Euro-style wine bar is populated at happy hour and beyond by both South Coast Winery members and wine aficionados. Dinner starters include beef carpaccio and fritto misto with calamari and shrimp. The menu features requisite steak and chop dishes, but we recommend exploring the seafood entrées, especially the Scottish salmon and the herb-crumbed Alaskan halibut served in a lemon caper sauce. Complete your meal with the panna cotta. On special occasions, or when you want to try several wines, ask the GM to pair picks with each course. You can even get a case of your favorite varietal hefted right into the trunk of your car.